Autumn is upon us, and the rain has finally come to us here in Kyogle and surrounds. 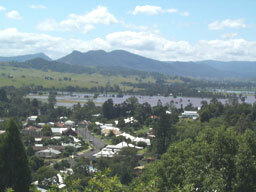 Flood levels were actually reached in Kyogle cutting many people in or out of town for only a few hours but it still created a great buzz around town. It was great to see (I didn’t actually get caught thank goodness) and I could finally clean out my little nursery and get those plants in the ground. What a great time it has been to plant. Before I get too carried away I should just say it’s fantastic to be back and a big hello to all our readers. For those of you that don’t know me, my name is Tara and you may have either spoken to me on the phone or in our retail nursery or you may have met me in our November 2002 Newsletter. I have been away from the nursery for about 9 months, having my first baby and watching her grow. She is now 11 months old and is just about to walk. She is getting into everything and keeping me very busy. We have also had another baby enter Daley’s world with our number one propagator, Carol having a beautiful baby girl last month. There must be something in the water here, so be warned if you are thinking of giving us a visit (only joking). Rick and Rod have also been very busy creating new heat beds for the nursery. They have come up with a fantastic idea and yet again have carried it off with great success. There are 5 benches altogether, 5m x 2.2m wide. The beds (benches) are made of 75mm thick concrete with 40 pieces of 13mm polypipe running through each bench, approximately 20mm from the surface. The pipes are filled with hot water from a 44-gallon drum that is heated from a gas hot water system. Below the poly pipe is reinforcement to give to benches strength. The water is pressurised by a high volume pressure pump and is continually circulated and recycled through the pipes and around the benches. The only improvement or modification the boys are now thinking of doing is to set up a solar hot water system as the main heating unit with the gas as a back system. The benches have had the thumbs up from the propagators not only for the success at heating but also they are easy to use and keep clean. The pomegranate is a fantastically versatile tree that produces large fruits used to produce delicious juices and preserves. They are wonderful eaten out of hand and it is not surprising that this adjective is the name of a famous variety of pomegranate. The bright colourful sacs of juice can easily be picked out of the rind, burst in the mouth they are truly wonderful. This is a great fruit to share. Pomegranates store extremely well in a cool dry place and continue to sweeten off the tree. The plant itself is very hardy and highly ornamental, it has large showy flowers and is suitable for use as a feature plant, for hedges and container growing, it also makes an attractive and interesting bonsai specimen. Soil Characteristics: Pomegranate is not fussy about soil condition, in its native environment in Northern India and Iran it is found growing in rocky gravel. Climatic Requirements: Best suited to mild temperate and subtropical climates as it favours cool winters and hot summers although it will settle for less and still fruit. It is extremely drought hardy and will tolerate some frost as it is deciduous. In dry periods young tree may need deep watering every 3-4 weeks. Culture: A shrub or small tree to about 4 m, the pomegranate is multi stemmed, spiny and extremely long lived. Plants are usually pruned to form a short but well defined trunk allowing 4 or 5 shoots to develop into a multi branched form. They have a strong tendency to sucker from the base, these should be removed. There are both edible and ornamental varieties of pomegranate. Harvesting: Fruits are ripe at the beginning of autumn, March time. They ripen 6-7 months after flowering and are ready to pick when they have good colour and make a metallic sound when tapped. The fruit should be cut with no stem attached, they travel well. Length of time to first crop: Two to three years. The plum pine is another surviving dinosaur tree that was abundant across the warmer wetter parts of present day Australia before the arrival of Europeans. The Podocarps originated in the Gondwanan forests of the Triassic period, 245 million years ago. They grew alongside araucarians, ginkophytes, cycads, tree ferns, giant clubmosses and horsetails, ferns covered the ground. The plum pine is a large attractive tree, growing to 40m, like all conifers it has a powerful presences in the rainforest. It is a dioecious species having separate male and female trees. One of each must be growing within pollination range in order for the female tree to set fruit. The fruits are an attractive purple black colour and composed of two segments. The edible portion is a grape like swollen stalk, weighing about 3g each. It has a juicy plum like pulp with a mildly resinous piney core. It is highly regarded as a bush food and has wide culinary applications in both sweet and savoury dishes. The inedible part of the fruit is the hard dark seed that is situated externally on top of the swollen stalk. This fruit design possible aids in the seed dispersal of the species and is attractive to birds, animals and humans. Despite having a low content of vitamins, except vitamin c, minerals, fat and protein the fruits are high in energy and are 61% water. Plum pine was felled extensively by the early timber getters for its useful timber which has wide applications from boat building to cabinet making. Despite this it has not been widely planted as a timber tree, this may be because it is not as light and strong as its relative the hoop pine. It has however been widely planted as an ornamental shade tree in both public and private spaces and now more commonly planted for the native cuisine market. I have several in my bush food garden. Their native range is the subtropical and littoral rainforests from the Illawarra to the Cape York Peninsula, they like rich, moist, non-alkaline soils, will tolerate salt spray and frosts to -7 degrees so long as they have good moisture levels and humidity. Maturing in 8-10 years the plum pine is fast growing once established. It can be kept in a pot as an attractive patio plant for its first few years where the beautiful bright flushes of pink new growth can be enjoyed.